Mr. Crosby's article on Shakespeare's attitude toward the working classes suggested to me the idea of also expressing my own long-established opinion about the works of Shakespeare, in direct opposition, as it is, to that established in all the whole European world. Calling to mind all the struggle of doubt and self-deceit,—efforts to attune myself to Shakespeare—which I went through owing to my complete disagreement with this universal adulation, and, presuming that many have experienced and are experiencing the same, I think that it may not be unprofitable to express definitely and frankly this view of mine, opposed to that of the majority, and the more so as the conclusions to which I came, when examining the causes of my disagreement with the universally established opinion, are, it seems to me, not without interest and significance. 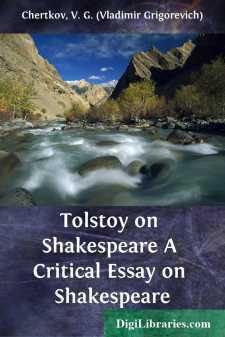 My disagreement with the established opinion about Shakespeare is not the result of an accidental frame of mind, nor of a light-minded attitude toward the matter, but is the outcome of many years' repeated and insistent endeavors to harmonize my own views of Shakespeare with those established amongst all civilized men of the Christian world. I remember the astonishment I felt when I first read Shakespeare. I expected to receive a powerful esthetic pleasure, but having read, one after the other, works regarded as his best: "King Lear," "Romeo and Juliet," "Hamlet" and "Macbeth," not only did I feel no delight, but I felt an irresistible repulsion and tedium, and doubted as to whether I was senseless in feeling works regarded as the summit of perfection by the whole of the civilized world to be trivial and positively bad, or whether the significance which this civilized world attributes to the works of Shakespeare was itself senseless. My consternation was increased by the fact that I always keenly felt the beauties of poetry in every form; then why should artistic works recognized by the whole world as those of a genius,—the works of Shakespeare,—not only fail to please me, but be disagreeable to me? For a long time I could not believe in myself, and during fifty years, in order to test myself, I several times recommenced reading Shakespeare in every possible form, in Russian, in English, in German and in Schlegel's translation, as I was advised. Several times I read the dramas and the comedies and historical plays, and I invariably underwent the same feelings: repulsion, weariness, and bewilderment. At the present time, before writing this preface, being desirous once more to test myself, I have, as an old man of seventy-five, again read the whole of Shakespeare, including the historical plays, the "Henrys," "Troilus and Cressida," the "Tempest," "Cymbeline," and I have felt, with even greater force, the same feelings,—this time, however, not of bewilderment, but of firm, indubitable conviction that the unquestionable glory of a great genius which Shakespeare enjoys, and which compels writers of our time to imitate him and readers and spectators to discover in him non-existent merits,—thereby distorting their esthetic and ethical understanding,—is a great evil, as is every untruth. Altho I know that the majority of people so firmly believe in the greatness of Shakespeare that in reading this judgment of mine they will not admit even the possibility of its justice, and will not give it the slightest attention, nevertheless I will endeavor, as well as I can, to show why I believe that Shakespeare can not be recognized either as a great genius, or even as an average author. For illustration of my purpose I will take one of Shakespeare's most extolled dramas, "King Lear," in the enthusiastic praise of which, the majority of critics agree. "The tragedy of Lear is deservedly celebrated among the dramas of Shakespeare," says Dr. Johnson. "There is perhaps no play which keeps the attention so strongly fixed, which so much agitates our passions, and interests our curiosity."